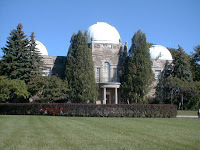 We, Toronto Centre RASCals, congregated on the lawn under the dome of the David Dunlap Observatory (DDO). Visitors, taking advantage of Astronomy Week activities, took their tour of the facilities, looked through the big telescope, then descended upon us. Ironically, our small 'scopes were more pleasing in some respects, offering wider fields of view. It was a good crowd. Lots of short and tall humans, all ages. Even staff from the observatory, kids in tow, dropped by. Many members turned out. I met Paul, Andrew, Mickey, and others. Saw Kirsten. Unfortunately, David did not show (which meant I didn't get to try his adjustable height chair). Had a long chat with Scott at the end of the evening. We had a good range of instruments, including a number of cat 'scopes, dobs, and a couple of refractors, home-built and commercial products, driven and not. We took turns looking at Venus, the Moon, and Saturn. I started chasing some double stars later in the evening. Many people enjoyed Castor at 110 power. I got my first look at the Whirlpool Galaxy (Messier 51 or M51) in Mickey's Meade cat. It was very faint with a bright centre (under our thin cloud layers). Did I see something else beside it, another smudge? That will be a great target to try in dark skies! When there were only a few of us left, we wondered about the moons of Saturn. I sketched the configuration so to look it up later. Funny: we all forgot—again—to bring info about moons. And none of us thought look in the Observer's Handbook. Overall, it was a good time, despite murky skies. I also brought a small square of carpeting. It worked quite well on the grass. I had been thinking about this since the Sharon school star party and had added to my agenda to get some outdoor carpeting. Whereupon I found an old roll in the overhead storage of my garage! Tried out the wood TV table that I had bought on sale last week at Canadian Tire. It worked well under the light box. Tried the new "big step" 3-step stool that I had bought this week on sale at Canadian Tire. I knew it would be a good choice. It worked really well, for young and old (I didn't consider that it could be simply used beside the eyepiece, for the "big" kids, as a way of steading themselves). Even Scott was impressed with the design, the curve of the top handle, the big steps, the white colour, not to mention the great price (this week only!). Tested the "astronomy box" with its new lid lights. They worked fantastic! Perfect amount of light. Scott said that he thinks the 5mW and 10mW green lasers he had are in the $100 range now. Hell, I'll buy one now if they're in fact that cheap. I guess the 75mW units are driving prices down. Scott and I also talked about educational matters and delivery and presentations. RASC has done things for Girl Guides and Cubs and Scouts, to name a few. This might be perfect if my summer astronomy seminar project flies. He suggested I talk to Leslie about getting access to some of this material. I had bought a beverage before arriving. On an impulse, I also bought a bag of Starburst. Apropos, I thought. 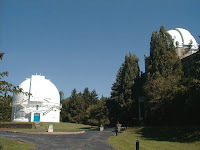 It is an impressive site, late at night, eerie yet majestic, above us, the dome, massive doors open, the darkness within, and 74" telescope quietly panning its bulk through the sky.